Flawless communication channels are crucial to the success of every business. You rely on email and mobile devices more now than ever to communicate effectively with clients, vendors and co-workers. When these tools fail, it can hinder businesses productivity, costing untold sums to your bottom line. These days, email systems often plug in to other applications, such as customer relationship management (CRM) databases, for tracking electronic communications. 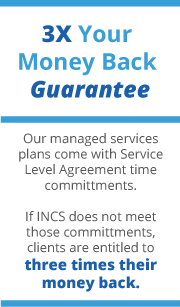 INCS will examine your corporate goals, strategies and workflows to equip your company with the latest tools for success. Whether it’s an on-site server or cloud hosting, we can provide you with products and services that meet your budget and improve reliability. Telephony has evolved rapidly in the past few years. It’s critical to partner with a firm like INCS to optimize your network and ensure you have reliable service. Our engineers are training continuously on the latest technologies to provide the best systems for our clients. INCS works with numerous voice and data service carriers to maximize your connectivity both locally and abroad.